ABC Analysis is the powerful inventory management tool which apply "Do the Right Thing First" concept and "Pareto" principle or "80/20" technique. ABC Analysis template in Excel spreadsheet will help material manager focus on the high-value turnover of material first and the difference priority classes will be assigned to the difference level of the inventory control. 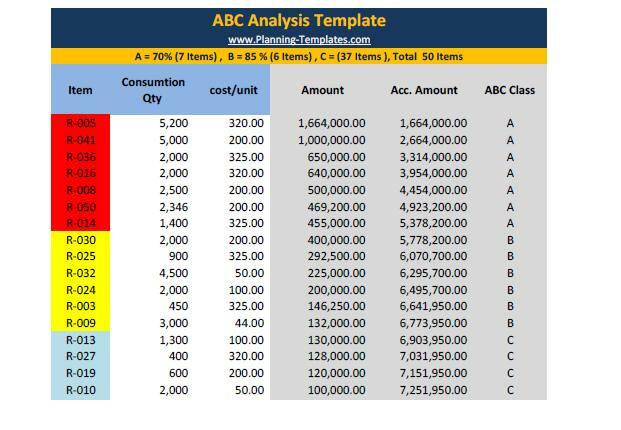 ABC Analysis Template: With ABC Classification you can manage High Inventory Value with Care, and saving on carrying cost on Low Inventory Value. Step 1 - Input ABC Classification Criteria ( A = %, B= % ).